8 REASONS TO CHOOSE FLY ODYSSEY FOR YOUR NEXT FLY FISHING HOLIDAY! Experienced staff who have travelled to all corners of the globe pursuing a large range of species. We guarantee to offer you the most competitive rates available for your selected destination. Our Team is made up of travel experts, field staff, experienced guides and casting instructors and trip hosts with first hand knowledge of each of our destinations. Comprehensive, unbiased views on the right destination for your trip based on your requirements. Your money is protected through our ABTOT and ATOL bonding ensuring that in the event of financial failure of our suppliers or ourselves then you will be re-compensated. All enquiries and bookings are dealt with in a timely manner. While travelling you will be able to speak with an advisor 24 hours per day in case unforseen circumstances interrupt your travel arrangements. Comprehensive pre-trip information pack prior to travel. Located on the highest point on this small island, the Acklins Island Lodge has prime position with a panoramic view of the ocean side and the Bight Flats. 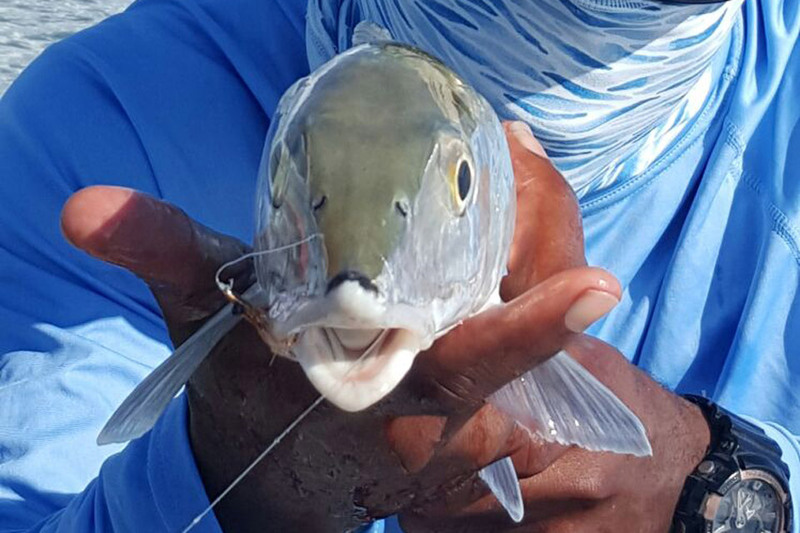 With over a thousand square miles of prime flats to fish, the options are almost limitless, including a population of willing Bonefish that see very little fishing pressure. Accommodation at the island lodge is like a mini village with a group of five cottages, three of which offer accommodation for twelve anglers across six bedrooms. Each cottage has two double/ twin bedrooms, all with private en-suite facilities air-conditioning and plenty of room for fishing gear and equipment. Clean, comfortable and spacious with a small shared deck, each cottage offers stunning views of the ocean, where you can watch the sunrise and sunset each day. The lodge has a small water treatment plant and as such clear, clean, freshwater is always available. The main lodge has a large kitchen, a living and dining-room, a well-stocked bar and a large deck. As with most of the Bahamain lodges, the cuisine is not fine dining but a mix of traditional Bahamian dishes using fresh locally sourced seafood, vegetables and meats such as chicken and beef. Perfect after a day out on the water. Pack lunches are provided with soft drinks and taken out for the day. There is internet connection at the lodge but you will need to bring your laptop or tablet. Acklins Island is an unspoilt outer island of the Bahamas that provides a true Bahamian experience untouched by development. The flats of the Bight of Acklins are expansive and offer endless miles of bonefish habitat. The Bight is scattered with sand cays, turtle grass, soft mud and hard sand bottom flats making it perfect bonefish habitat. Huge numbers of fish are found here with a great diversity in sizes. For anglers who prefer to wade and walk the flats when bonefishing rather than from a skiff, this is the place to come. Here, the guides use the skiffs mainly as a mode of transport to get from one location to another and such are the expanse of flats that the best way to explore the fishing is by wading. It is therefore essential that you have good wading boots and socks so that you are comfortable walking all day. Most of the flats are a hard or semi hard sandy bottom. The west side of the island is a myriad of creeks, bays, channels and mangrove shorelines which offer an extensive habitat for Bonefish and hence a very productive fishery. The ocean side to the east, where the flats merge with the deeper water, attracts larger Bonefish and the occasional Permit. When the wind gets up, this side can offer protection with some sheltered areas. If the weather closes in, the lodge has the facility to use a truck to get anglers to the sheltered part of the island rather than a prolonged wet lumpy boat ride, which enables guests to maximise their days fishing. As per all Fly Odyssey bookings, we will provide a comprehensive and detailed pre-trip fly fishing guide and advise of travel requirements prior to your departure. The rates for this destination vary throughout the season. We offer the best available rates for this destination and do not charge for our service. By calling we are able to tailor a package to specifically suit your requirements at the best available rate. As we have offices in both the United Kingdom and Australia we can also ensure you are being quoted in your local currency. Please enquire for the latest rates and availability, including information on any applicable special offers and group discounts. Passport with minimum six months validity. Nationals of the European Union and Australia DO NOT require a visa to enter the Bahamas. There are various international flight options either direct or via US or Canada to Nassau. From there, take a flight to Spring Point Airport. There is a Bahamian departure tax of $15.